It’s that time of year again – time to get the old leaf sucker into shape to perform its annual duties. I’ve had this thing for just 20 years now, and there’s always something that needs fixing. It’s worth it, though: it works so well I often feel like I’m making a commercial for it when I clean up the leaves. The two repairs this year were fixing a seam in the canvas tube that feeds the bag and beefing up the patch on the hole in the right angle plastic chute that redirects the leaves so they go up the tube. 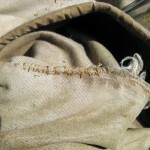 The seam repair was two rounds of whip stitch with a big needle and some heavy thread. 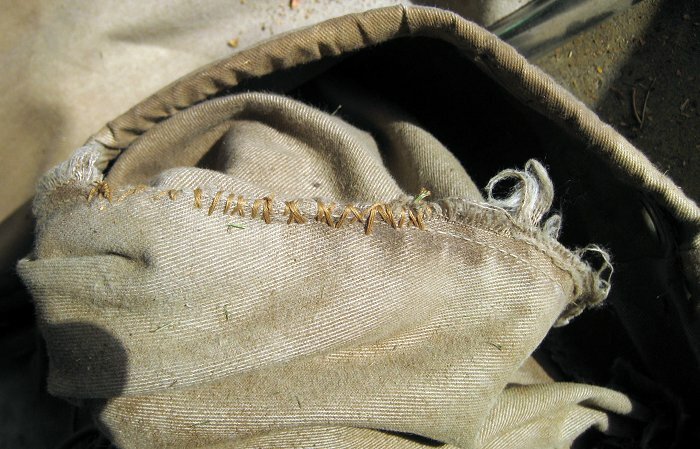 There’s usually some part of the aging canvas bag that needs to be patched up. A dirty job, but pretty quick. The plastic chute repair was more challenging. In addition to the fairly benign leaves that get blown horizontally into the chute to be rerouted up into the bag’s canvas tube, stones are occasionally picked up and whipped out by the impeller. Many years ago, one knocked a hole in the corner of the chute. I’ve covered it up with a couple layers of duct tape every year, but new stones blow holes in that, too. I found a piece of HDPE covering part of the hole from an earlier repair when I ripped the tape off this time. Update 11/30/12: Oops. To my substantial surprise, maybe the second time I used the vacuum after the repair, I noticed the patch had blown out! 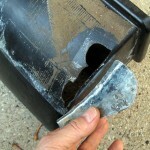 No damage to the steel patch or the plastic, but the duct tape on the large curved side had all pulled off. I’d been lazy and didn’t really clean up the old tape residue, though I’m sure I did a quick alcohol wipe off. 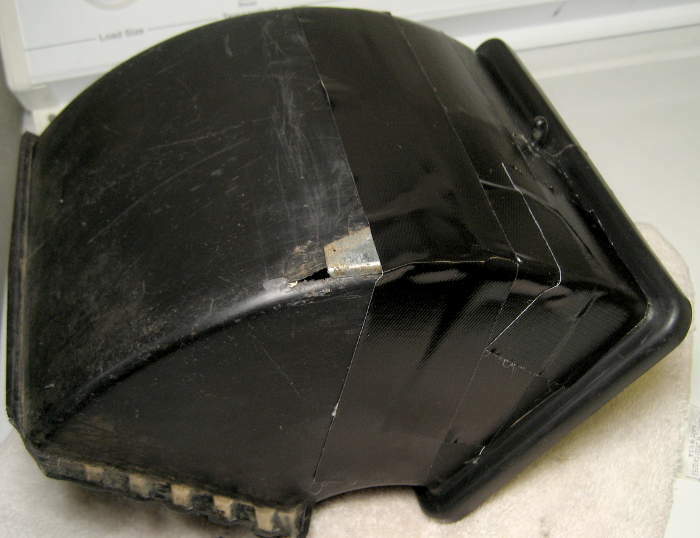 OK – I took all the tape off, cleaned it all up properly with Goo Gone and alcohol, used the good duct tape, and extended the tape all the way across that curved side and a little on the other side. Now it should be good for another year or two. Here it is with the repaired chute in place. 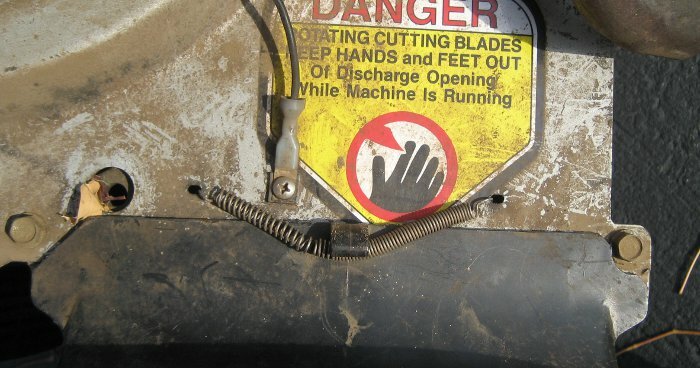 It has a clever safety interlock to keep it from being started when the chute/bag are not installed: A spring that clips over a hook on the chute to hold it in place is positioned so it shorts an ignition wire to ground when it’s not stretched over the chute hook. An elegant solution. While the machine picks up leaves (at least dry ones) very well, and shreds them so they pack to about twice the density of hand raked leaves in the paper bags our town requires, it’s a nuisance to empty the canvas bag into the paper bags. 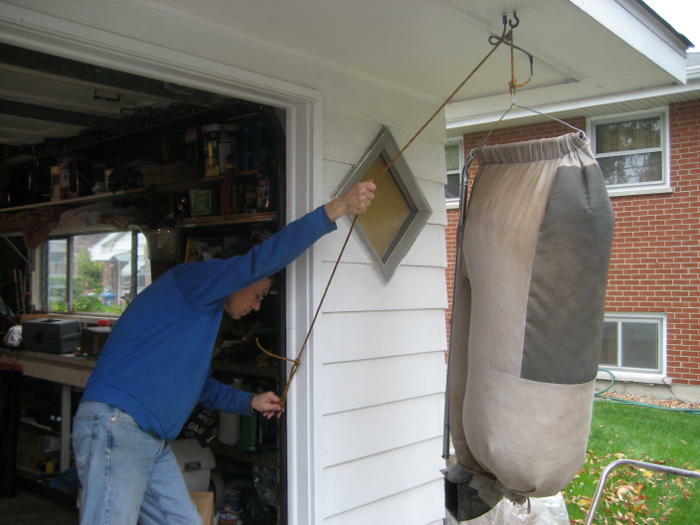 The canvas bag empties out the bottom (tied closed with a cloth string while running – another low tech but very effective design), but the bottom of the bag is near the ground – not easy to dump into a paper bag, especially after the first load. I addressed that many years ago by building up a platform out of scrap plywood and bent 1/2″ conduit. (Yes, there are a couple of supports under the ramp.) It’s a little bit of hassle to haul out and set up, and for emptying the bag once or twice it’s not worth it. But with the twenty-odd dumps of a major leaf pickup, it’s a very welcome helper. Update 2/27/16: Some time ago (pictures were dated 10/13; might have been before that) I replaced the ramp bag emptier that had served for years with a rope and pulley system that works better and has a much smaller storage footprint. It requires the extra step of disconnecting the bag from the machine and reconnecting it after emptying, but the actual hauling the bag up in the air is quite fast. 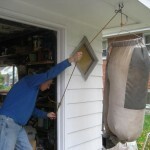 A heavy wire bridle attached to the bag’s support tube provides a place for the hook on the end of the rope. Another hook on the free end of the rope hooks nicely into a hole in the garage door track. The big benefit is that the bag is noticeably higher and thus easier to empty into the paper bag, especially for the last bit to fill the paper bag. (I’ve been planning for a long time to replace the twisted poly rope with something braided. Maybe this year!) Looks odd, but this is a real winner. The steel patch re-taped in the note above held thru the 2015 leaf season, but the tape was in pretty bad shape at the end. I brought it in the house with plans to clean and re-tape it some time over the winter/spring/summer. I did that cleanup at the end of February. 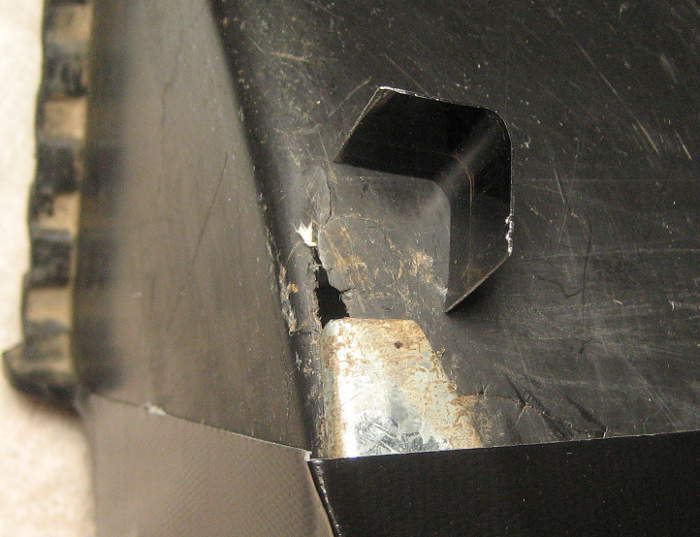 Unfortunately, the chute had suffered further thinning to the point of a full opening past the end of the galvanized patch. I bent a bit of the 3/4″ x 0.022″ black steel strap I scavenged from pallets of pipe for storm water plumbing under our street a few years ago. It’s all taped up and ready to serve next fall and, I hope, several falls to follow. Update 11/22/16: Special thanks to Jack (in comments below) for a suggestion for the mesh material to make a bag. I haven’t tried it, but Phifertex, a sturdy woven fabric for outdoor furniture might be just what a bag maker or repairer needs. If anybody tries it, please post and let us know how it works out! Also – I finally replaced the rope on the bag lifter with a braided one. It’s nice to have it not spin any more while trying to untie the bottom of the bag and get the leaves into the paper bag. Update 12/14/17: I may be able to score a sample of a Phifertex mesh material for a test of [re]building a bag. If anyone reading this is actively interested in working on a bag but has been stymied on the mesh, maybe we can work something out. Especially if you’re in a position to produce some bags for the niche market of users of these great old machines, I’d like to try to help, including reverse engineering a bag to make a pattern. Please reply in the comments. Thanks! Update 11/1/18: Bag plans are now available! Check them out here. Pics here. 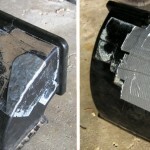 This entry was posted in Home Repair and tagged 71.85681, 806008, Craftsman, duct tape, leaf, phifertex, replacement bags, shredder, sucker, vacuum. Bookmark the permalink. Sorry, not much help. I do have 2 bags, but the older one is really worn out. Dry rot, several rips in the canvas (some with frankenstein patches). Worst is the exhaust screen stuff. Several patches there, but more rips unpatched. I guess I got my second one just before they stopped making replacement parts. So the old bag is essentially useless as is, but I guess I’d like to keep it around in case the machine outlasts the current bag. If that happened, I suppose I might take the old one apart to use it as a pattern for making a new one from scratch. The canvas should not be much of a problem, but I don’t know what I’d have to do to find a suitable screen material. I suppose if you were desperate enough to design/make your own bag and open source the plans, we could talk. Thanks for the link to purchase the bagger for this machine. Thanks, Adam! I don’t usually allow commercial comments, but this is right on target for a hard to get item. I’ll keep it in mind if my dear old vac outlasts its current bag. Wow – those bags are really big! Adam,I purchased the chute and bag. Does the bag include the hanger because I didn’t see that as a separate item. I need a bag for mine as well. The Lawnbagz website seems to be having issues now. I am not able to see what or if they have anything. Does anyone know where else to buy these bags? I’m sorry for all of us that Lawnbagz.com seems to be out of business. I found a skeleton of their home page in the Wayback machine here. My machine, a 113.796812, originally spec’d the bag as 71.85681, for which the 806008 is a replacement. I have one good bag that’s in service, and its beat-up, retired predecessor. I’m not interested in going into production, but it would be nice if someone jumped in to fill the vacuum (pun intended) left by Adam’s closing down. I suppose if someone wanted to do that, I might be talked into donating my old bag as a pattern, in exchange for one of the new bags. Anybody else with info please chime in! I’ve got 7 of these machines….I have modified the motors…if anyone knows, Sears has no reason for their troubles…these machines paid Sears to be debt free, they sold MILLIONS! Shame on you Sears for NOT keeping the good tools and for not remaining to sell parts to things you sold…sad..really sad…Anyways, I have myself one old bag left and a new one made….I may be able to have someone I know make me some more of these bags. I’ll have to see….in the meantime…don’t give up on these machines…they so cool……a tool………. Hi Doug! I agree that these are amazing machines (and sad/surprised Sears abandoned them). Thanks for the comments about the bags. Some people have found their way here looking for them, so if you end up with a source, I’ll be happy to post a link here. I need a new bag, too. I am going through our third bag (I inherited the vac) and the mesh vent has ripped (and the rip is expanding, of course). Too dusty for duck tape. I thought that I would start looking for a bag now, with fall coming up soon enough, but found that nobody seems to sell them anymore. Maybe I’ll look for some plastic mesh that can be sewn onto the canvas to cover the existing, ripped mesh, as Jim suggested. 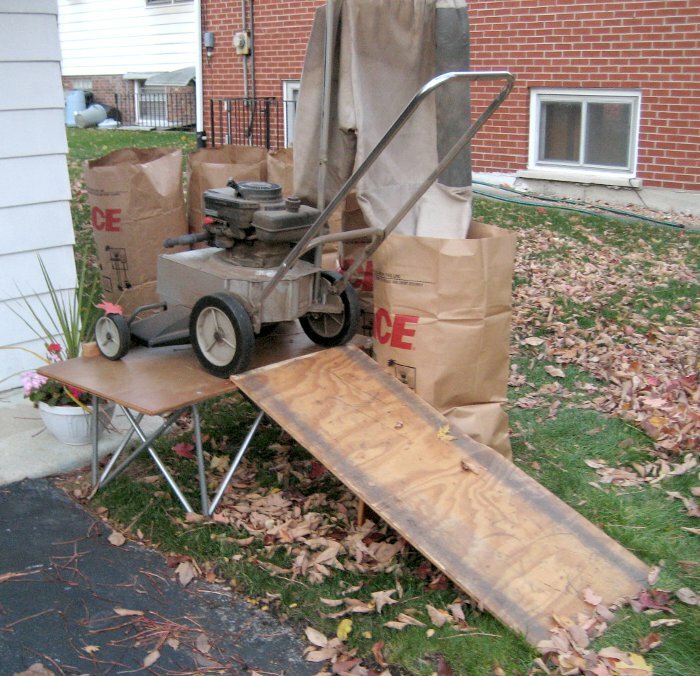 I vacuum a lot of leaves, by the way, countless bags each fall, and so heading to a pulley system each time to empty the bag would be too time consuming. I put the end of the bag (open, tied end) into a lawn bag (lowes; home depot paper lawn bag) and then shake the vac bag contents into the lawn bag. 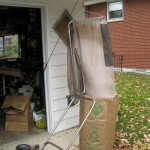 The lawn bags hold about two vac bags worth of shredded leaves. If anyone decides to make and sell a canvas replacement, a zipper at the opening instead of a tie string would save a bunch of time (wrapping and re-tying the string while wearing gloves is no fun). I agree that this is a near perfect machine for picking up and shredding dry leaves. Has anyone experienced an alternate that performs as well? Just curious: How do you manage to get the filled canvas bag into the top of the paper bag, especially for the second (or second-and-a-half) canvas bag load? It’s avoiding that wrassling that has made it worthwhile to me to haul the machine and bag back to the garage pulley to dump each time. 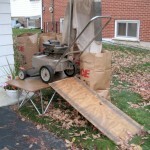 (The old platform was portable, so I’d haul that out to where the leaves were for emptying before the pulley thing.) I go out several times a season, but rarely fill more than 5 paper bags at a go. Hmm – Maybe a hybrid approach? Emptying the first canvas load into a paper bag is pretty easy, and certainly quicker than hauling back to the pulley dumper. Maybe start the first several paper bags on the spot, as you do, then schlep those 40% full bags back to the pulley dump place and finish up as I do now. Would save several trips back to the garage and several pulley cycles. I’ll have to try that next time. Thanks for the inspiration! If you used a good quality heavy duty zipper, I agree it would be easier to open and close. I have to take my gloves off/on for each string retie, too. I’d be a little concerned about leaf debris jamming the zipper, but it’s worth a shot. I haven’t looked either, but it seems like somebody ought to make a similar machine. Anybody find one? Jim I just picked up one of these that someone was throwing away they thought it did not work. Started up on the second pool just need some gas some oil and that was it. Where did you say I can get any type of parts for them. I just took a look at searspartsdirect, and most (all?) 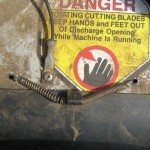 of the machine-specific parts are marked “no longer available”, so no luck on a parts source. I keep hoping someone will chime in with a source or offer for bags, but nothing so far. Looks like you’re pretty much up to Mac Gyvering your own replacements. If you (or anybody else) is desperate enough to try to make up a bag from scratch, let me know and I’ll take some pics and make measurements of my bag and support tube. Good luck with your machine! I just had a great idea that may add life to your bag. 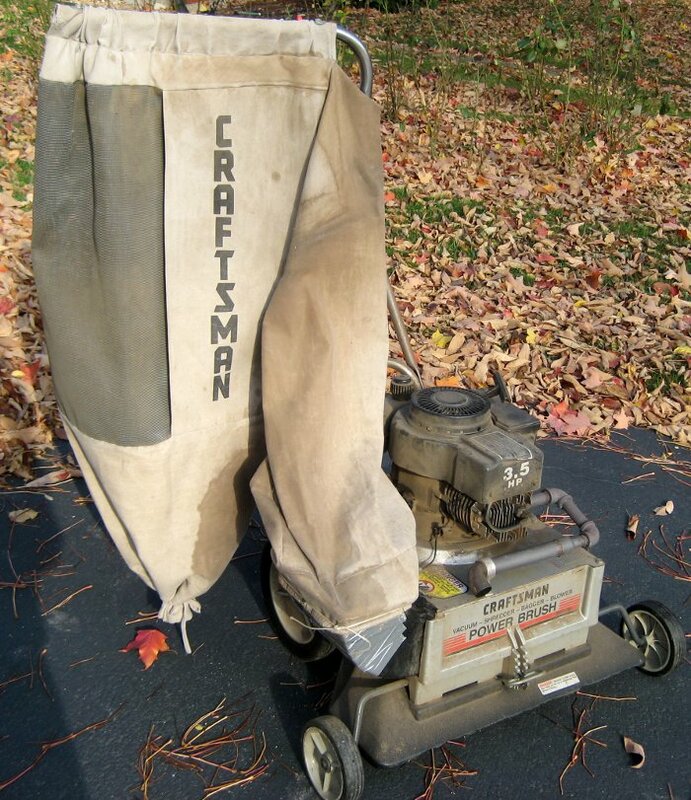 I own one of these lawn vacuums as well and really fear the day my bag splits open. I was thinking if you turn it inside out and spray it with flex seal. I may try this to see if this can add some life to the bag. Interesting idea! I’ve never used Flex Seal (and hadn’t heard about it until just now! ), but it sounds like it might do a good job of reinforcing the canvas. In my experience with these bags over the years, I don’t think I’ve seen split bags, but mine live in the garage and don’t get baked in the sun. I’ve seen a couple of split seams, and Flex Seal might well seal the threads and help keep those from failing. But the larger problems I’ve seen are with the exhaust mesh. Over time that tears, and repairs are hard. I’ve never made a search for a suitable material, but what I’ve seen at normal fabric stores is too wimpy. I just took a closer look at it. Here are pics of my current bag (left) and the original. Don’t recall ever seeing fabric like this. It also looks like the newer bag has heavier threads in one direction. If we could get the material, it might take a kind of heavy duty sewing machine, but the repair probably wouldn’t be too hard. Anybody ever see this stuff? I suppose a first place to look might be sailmaking suppliers for tough, long wearing materials. I picked up one of these machines for $10 on Craigslist a couple years ago. The seller was unloading it cheap because he thought it had a bad piston. I took it home and discovered that the only problem was a pinhole in the carburetor float. I had a spare float in my garage so I immediately swapped it out, changed the oil and added fresh gas. It’s been running like a champ ever since. Regarding the bag, if you have the old bag as a template a new bag would be fairly straightforward to recreate. Canvas fabric isn’t that expensive and if you don’t know anyone who can sew it, then a wanted ad on Craigslist should help you find someone willing to take on the job. For the mesh part, I think Phifertex mesh might work. It is used for cushions and is pretty durable. Great Craigslist buy, Jack! I agree the canvas side of making the bag shouldn’t be too hard. And thanks for the suggestion of jobbing it out on Craigslist. I wasn’t even aware of posting a wanted ad like that. And the Phifertex suggestion looks like it might be just about right material. I’ll add a mention to the post. Greetings. 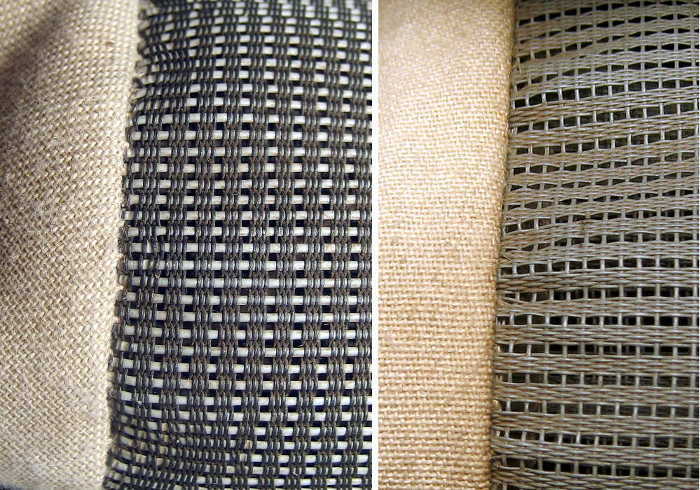 I’m in the same boat and starting thinking about using woven speaker grill cloth – a kind with a lattice weave almost like a cane chair. 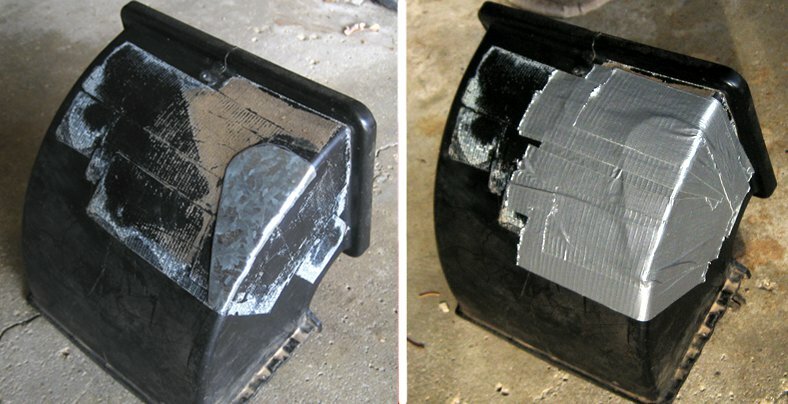 Some of the ones I’ve seen for guitar amp restoration look like they might be ok with respect to airflow. 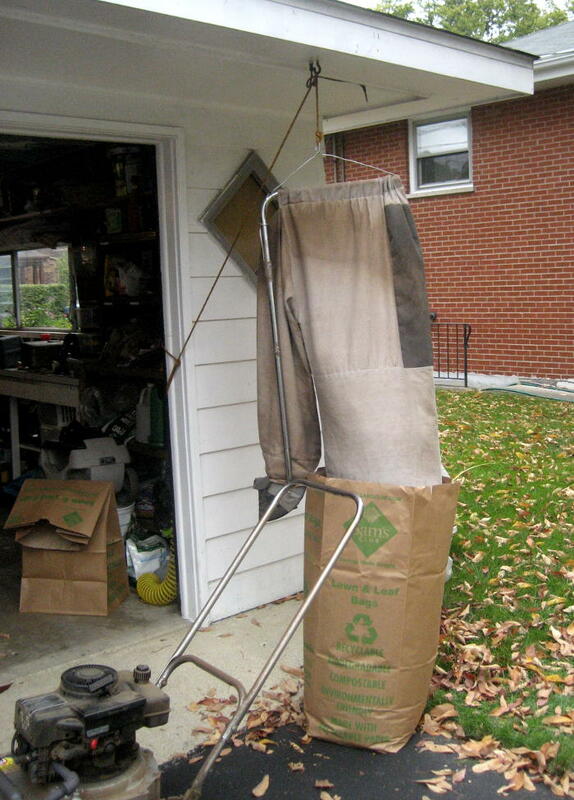 I am looking online for a replacement bag to this 3.5 HP shredder/mower and i can not find it anywhere! Ive checked ebay, amazon, craiglist… does anyone have an extra bag and are willing to sell it, or have any idea on where to buy a replacement. Good luck looking for a bag! I suspect there’s a niche market making these bags if we could find someone with some basic sewing skills and a medium heavy duty sewing machine. As I’ve said, I have an old bag I’d offer for a template. So how do we find somebody looking for some side jobs with those skills and a machine? Sailmakers? Upholsterers? Is there a clearing house for stuff like this? I just posted on my local makerspace’s email list asking if anyone knows anyone who might be interested. do you know where i can get ca carburetor for this ? Sorry, I can’t provide any direct help. I seem to remember running across ca carbs (or references to them) when I was trying to figure out which one I had and what would fit. The good news is that there’s a fair amount of info about parts and substitute parts for various Mantis models on the internet. If you can’t find a ca, I’m quite confident there’s another Zama carb that would be appropriate. Or just take the old carb to a local lawn mower repair shop and ask. 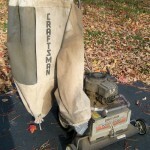 Another autumn has come and gone and the old Craftsman lawn vacuum helped me through it once again. I can’t believe how incredibly dusty I get when I use this thing. I couldn’t imagine using it without a breathing mask, especially when emptying the bag. I just ordered a replacement carburetor (Tecumseh 632046) for $15 because the engine would start and quit after a few seconds until the engine was warmed up. Hopefully the new carb will have it running strong again. My bag is still holding up, but part of me is compelled to try to make a replacement since we have a heavy duty sewing machine in the house. Hmmm. Other than that, I’ll clean it up, give it an oil change and store it until next year. The best $20 I spent on Craigslist five years ago was for one of theses machines. Nothing but oak leaves ankle deep here in NW Indiana this time of year. 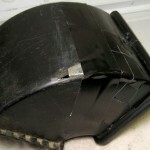 However, similar problem…..the mesh on the bag has been patched many times with pieces of nylon window screen and JB weld. As far as emptying the bag, I use a plastic clamp to secure the bag at the bottom. 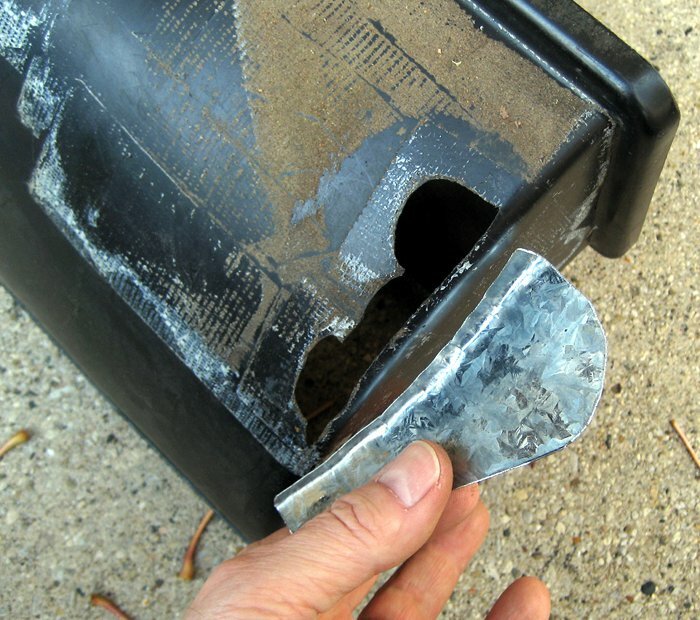 When full I’ll slide a plastic garbage can up under the bag, reach in and open the clamp. Any ideas on rebuilding these bags would be appreciated. 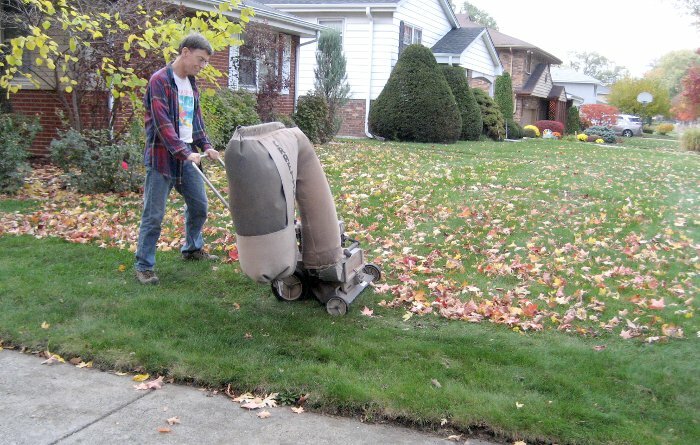 Another note: I also use the machine as a leaf blower. I remove the curved shredder grate and the plastic chute then secure a piece of thin sheet metal over the to of the discharge opening. Works great. Sorry, no new insights on bag patching. Obviously the hard part is the mesh. How has your nylon window screen worked out? My concern would be that it was fine enough that small leaf debris might clog it from the inside. Have you seen that as a problem? Interesting that you’re still running the shredder grate for leaves. I pulled that out years ago, and while I don’t get quite as good compaction from my coarser leaf fragments, it feels like I get better overall performance: More air flow and more leaf thruput when I plow into a very deep pile of leaves. Do you have any problems running the grate? Thanks for the reply. The nylon window screen material works OK .It cover a place in the mesh where there is a split. 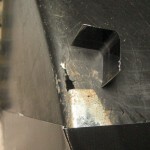 The screen is glued on around the edges with JB Weld. Without the grate that shreds oak leaves into confetti the bag would fill up in only a few minutes. I have to watch as not to overfill the bag. The machine would tip over backwards from the weight. 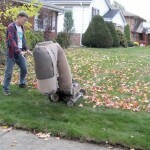 The only drawback about vacuuming leaves is it doesn’t work very well unless the leaves are dry. The shredder grate would clog otherwise. I use it mainly for blowing leaves out to the street. It’s like using a 3.5 HP handheld blower. If there is a way to post a photo let me know. I’m going to take a stab at making a replacement bag just to get an idea of cost and level of effort. At the very least, I should be able to come up with a template and supply list in case anyone wants to make one for themselves. I’ll update here as I make progress. Well I started making the bag. I picked up 3 yards of canvas duck material, which seems to be the perfect strength, but I probably only needed 2 yards. I also ordered a yard of Phifertex which should hopefully arrive next week. I used my existing bag as a template and cut out all the material needed to put together a new bag. I still need to pick up some metal grommets to secure the bag to the top bar and to the hook by the discharge chute. I’m probably looking at about $50 in costs. The duck material was $10/yard at Hobby Lobby, but they always have coupons online so I saved 40%. The Phifertex was $26 with shipping. Metal grommets might be $5 or so. More updates soon. Got the bag finished a couple weeks ago. Looks great. Too cold and snowy to test it but I’m confident it will hold up well. where I might be able to get a shredder grate. Mine is missing.